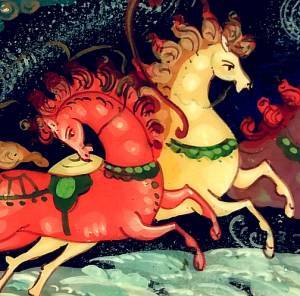 from Mstera by I. M.
This colorful, lively work depicts one of the most traditional Russian scenes: a three horse sleigh, also known as "Troika" in Russian. Swiftly ride the three steeds, being generously whipped by the coachman. On the back of the sleigh a couple is sitting: the young man is looking at the young lady, as she holds his hand and gazes to the right of the carriage. Scattered white whorls of snow and the fluorescent blue color forming the backdrop of the scene convey the atmosphere of Russian winter. This box is a case for glasses that was customized for miniature lacquer painting. The bottom of the box has the same fluorescent blue tone as the composition. The box sits flat and has a hinge at the top. The inside is lined with a soft beige material. The bottom of the composition is signed with the name of the work, artist's initials, and village. Lacquer is in very good condition. A wonderful present for someone who wears glasses and is fond of lacquer boxes.